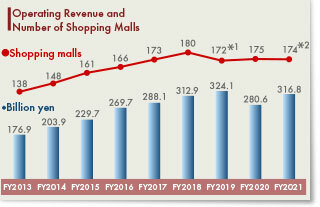 In order to contribute to providing surprising, exciting, and pleasant experiences that attract people from the local community, AEON—the largest retailing group in Japan—has been using the rich know-how in retailing built up by one of its core companies, AEON MALL, to the full in developing shopping malls. AEON MALL is a specialist shopping mall developer. Our philosophy of putting the customer first has guided our continuing efforts to create malls that enhance the quality of life, stimulate local economic activity and contribute to community life and culture.